And most important have fun guys and gals! 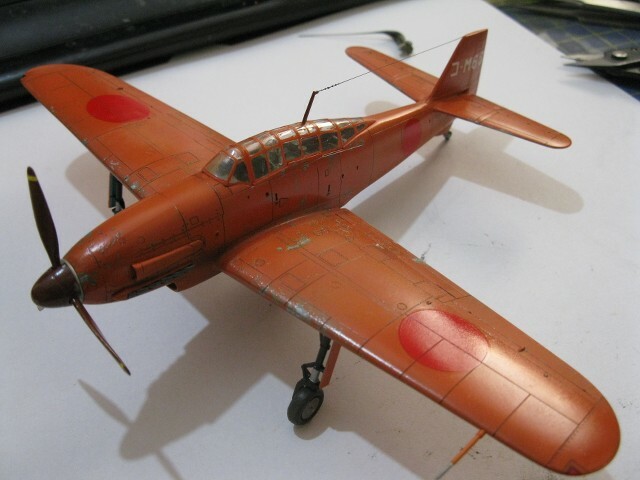 Crown r n7: 1/48th Tamiya Mitsubishi Raiden: Finished photos page 7. Zvezda1980: Tamiya 1/72nd M6A1-K Nanzan: Finished photos page 4. Big thanks to Rock Baker and Jack/Jgeratic for the badge!!! 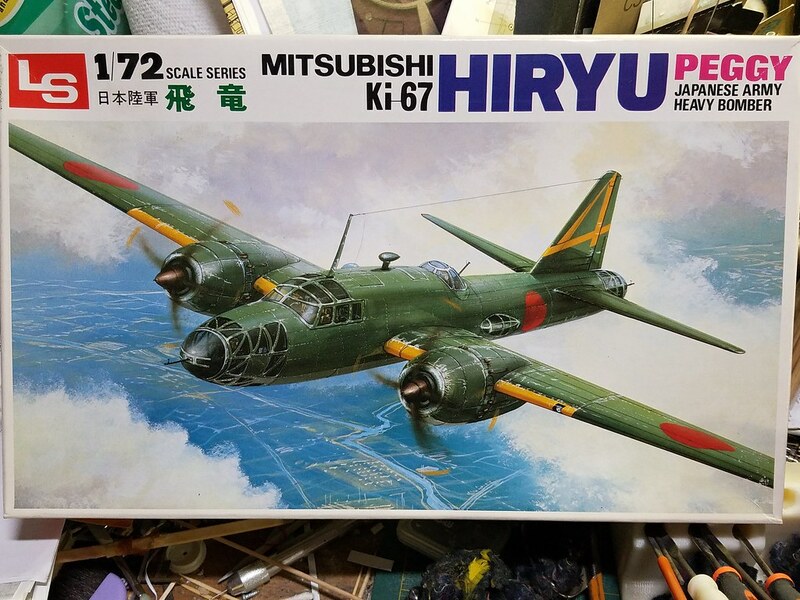 For starters, I'm thinking a 1/72 Hasegawa Betty. I'll get a picture later. Sounds awesome Steve. I've had one of those in my stash for ages but never seem to get around to her. Yeah, it doesn't look too complicated but fun. You must mean December 31 as the end date? Since I haven't started the Betty yet I'll make it my entry for this one. Tamiya 1/48. Here it is, oldie but goodie. Guys: Great choices, just put you all down! Steve: Gotta love that box art! PS: And sorry guys, with multiple Johns I think going by your callsigns will probably be the best way to keep me from getting confused again. Can you cross over my Tamiya 1/350 I-400 build from the JGB VII, please? 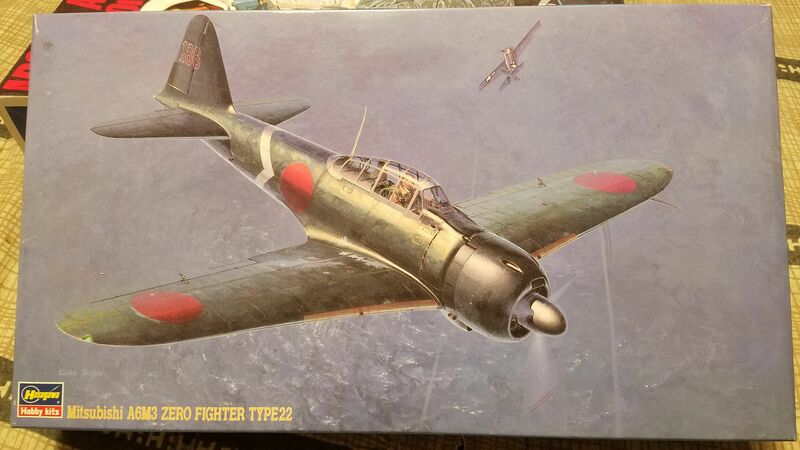 Gamera, I'll join with the 1/48 scale Tamiya kit I was originally going to do for the last GB, the A6M5 Zero "Zeke." BTW guys I'm still racking my brain trying to come up with an idea for a badge. I've been thinking of getting my friend Rock Backer to do up another young lady but I can't think of anything beyond that. Anyone have any ideas??? 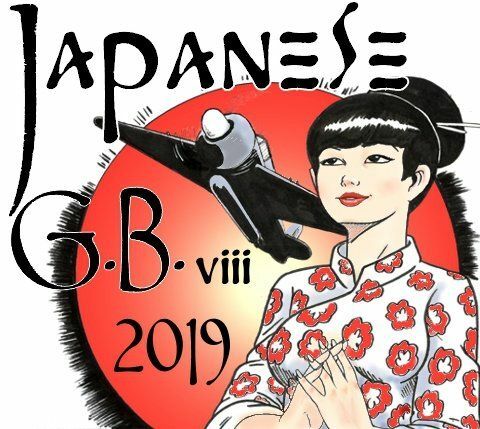 No unless you use some material subject such as airplane, ship, tank, or just the Hinomaru (you can't use the flag, I'm doing that for the Japanese Ship GB, well, a few years from now ) a young girl just seems to go with their culture anymore. Ironic. What about the medal 'Japanese Order of the Rising Sun' - it is considered 8 pointed? I found also the Kagome Crest is an eight pointed star, but on it's own looks exactly like the Star of David (Israel)- so is better off used as a background in pattern form? I'm in for this, subject TBD. Sure, just put you down! I like that Jack, very cool! It's just I'd been going with the gal since Baker does great 'girl' art. So I figured I'd do it again, went with her as a pilot twice and a sailor once. Not sure where to go from here - a tanker??? I guess we don't have to go with her, I did do the Godzilla one and there are a few other ones in there too. Cliff, yes definitely continue the girl series of badges. The medal images I've linked, as well as a possible Kagome pattern, were suggested to be used as a background element. The 'pinup girl' would still remain as the main focus. Thanks Jack, thinking now of just having the gal in a kimono (haven't done that yet) with the Kagome in the background maybe??? Kimomo is an excellent choice, very reconizable as Japanese, and the Kagome helps tie in the concept of the number eight. I'm in if Modern Japanese Armor is ok, I have the 1/48 Tamiya JGSDF Type 10 tank. Sure! Anything Japanese. This if fine, a samurai figure or a Yamaha motorcycle would be fine too! You could cross-post over on the Modern Armour GB too if it's okay by Sailing Dutchman. 1). 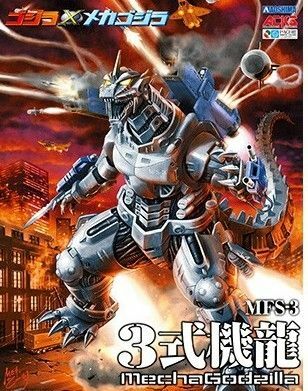 Aoshima Mechagodzilla. No friggin' clue what scale. It's in my private warehouse with HobbyLink Japan. Will be getting it sometime early next year. 2). 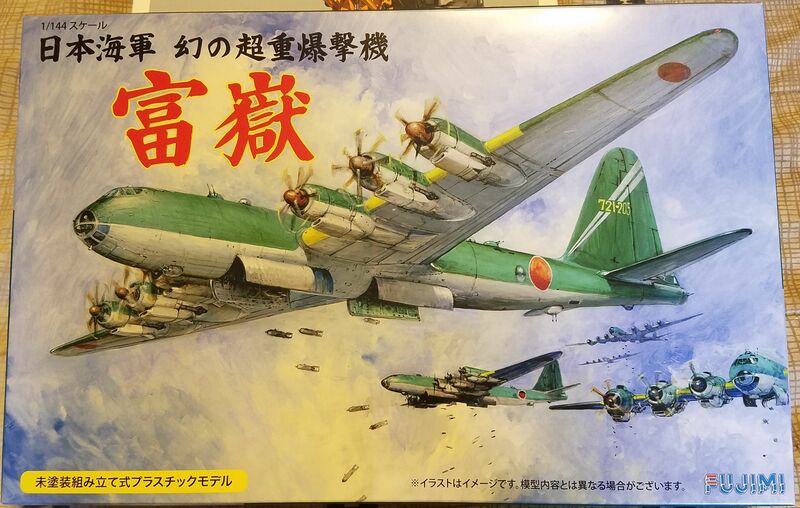 Fujima 1/144th Nakajima G10n Fugaku America bomber. 3). 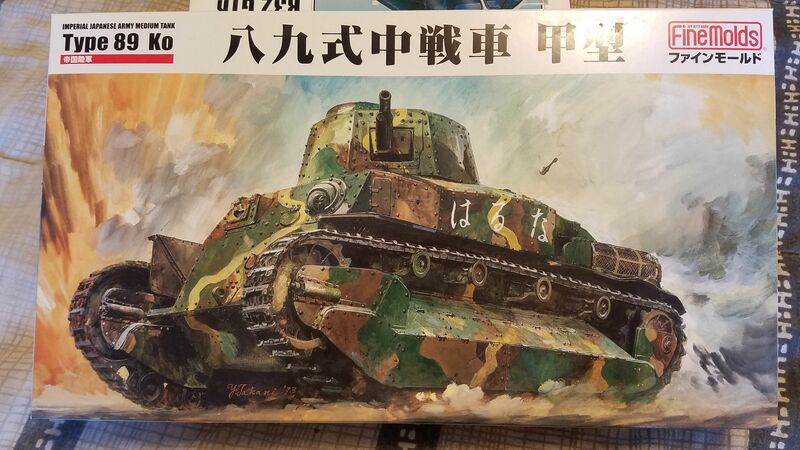 FineMolds 1/35th Type 89 medium tank. 4). 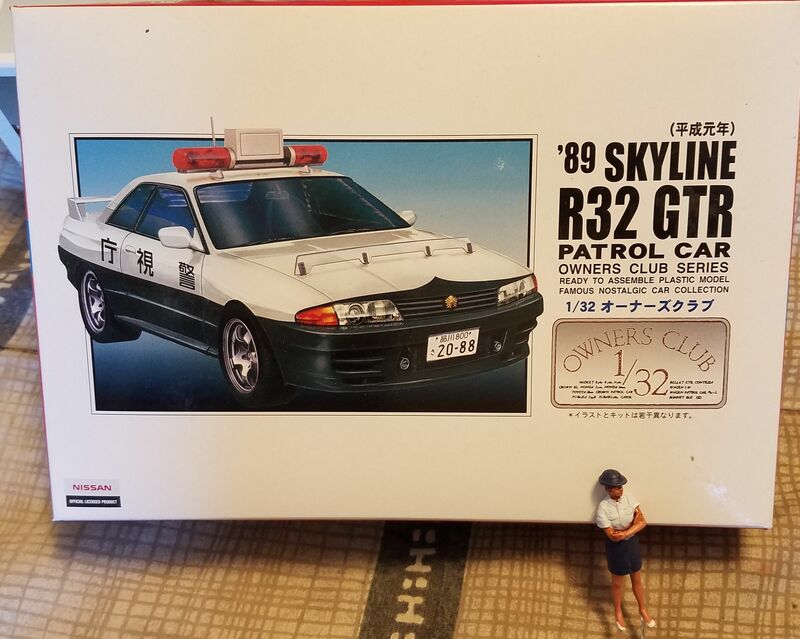 Nissan 1/32nd '89 Skyline police cruiser with police lady figure. I'm hoping to work this somewhere in with an early '90s JGSDF MBT. 5). 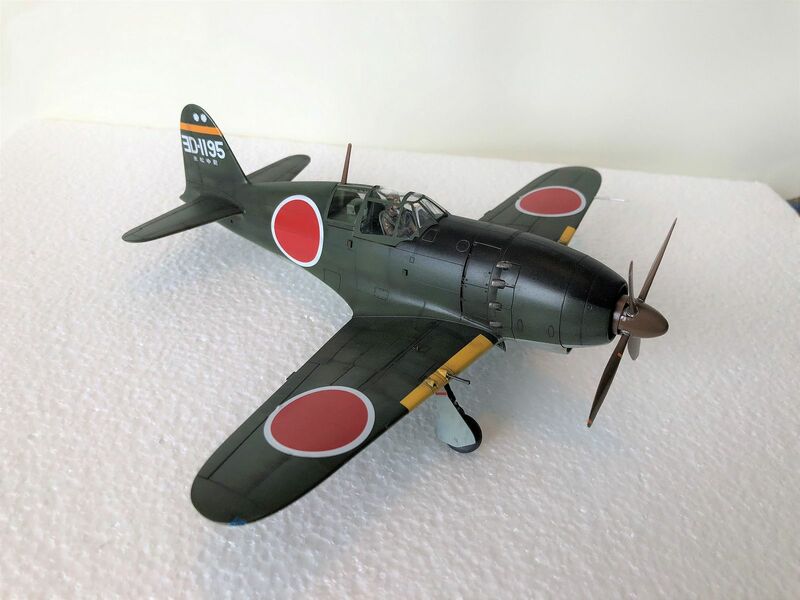 Hasegawa 1/48th Mitsubishi Zero 22. Can't help but stick a Zero in there somewhere. 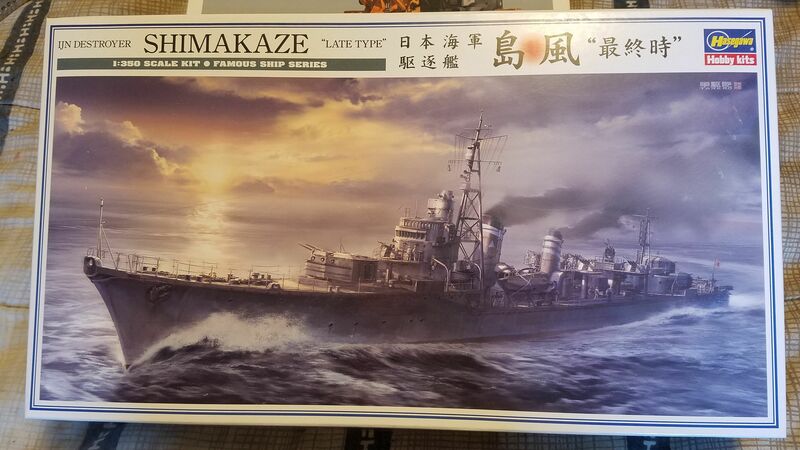 Runner up- was going to list this but going to save it for ModelCrazy's Japanese Navy GB. Steve, did you set a date for this yet? Hey Gam, looks great, especilly the America Bomber, Zero and DD. By the way, the Japanese Flaged GB won't happen for a while. I want to do the American and German first. If you want you can save the DD until Japenese GB X. Hey guys!! I'm still kicking around. Gam I'm just checking in, not going to commit to anything at this time, the E7K is still where it was last year. Might even drag out a new one I've gotten in the past year I'm keen to do the camo on. Anyways wishing everyone a very Merry Christmas, hope all is well!! Steve: Thanks! Guess I'll sit on the Shimakaze a little longer then. I really don't need to jump in with anything that big anyway with my backlog. So you're voting for the G-10N and the A6M Type 22 then. Simpilot34: WOW, it's good to hear from you again. Seems like forever! Hope you're well, everything is pretty much the same here. It'd be great to have you aboard again but thanks for just checking in. Merry Christmas and best hopes for the coming new year! The Zero for sure. It's a must.